These books were printed the 1980s and they will not be reprinted. There are few left. Volume One is already no longer available. All Volume Two copies are damaged in some fashion, (dented covers, yellowed edges, bent corners, or slight water stains) and will only be sold here until the stock is exhausted. All sales of Volume Two are sold at half price and all sales are final. All books are readable but damaged. The Secret and the Church A moving commentary on the First Secret: the heroic and touching lives of the little seers. Explains the earth-shaking fulfillment of the prophecies of the Second Secret: the deliverance of Portugal, Stalin’s gulag, and the terrible chastisement of World War II. More photos, including “50th anniversary” photo of Sister Lucy. 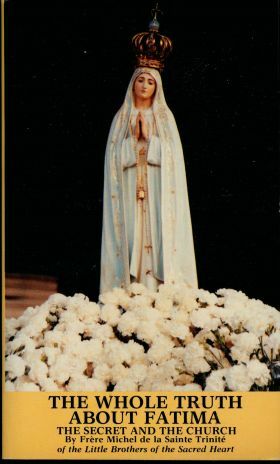 The entire extraordinary mystery of Fatima, studied step by step from the beginning; for our conversion and our salutary consecration to the Immaculate Heart of Mary; so as to arrive at the discovery of the Secret of secrets, the third part of the secret given by the Blessed Virgin Mary on July 13, 1917, which is still hidden at Rome; and to put an end to our fears, for there is a victorious, glorious conclusion to this era of errors, carnage and persecutions spread all over the world by Russia as Mary, and She alone, had announced in 1917. Let us go forward, then, for we shall see the salvation which only the Immaculate Heart of Mary could promise and will obtain from Jesus for us! This three volume masterpiece was written by Frère Michel de la Sainte Trinité of the Little Brothers of the Sacred Heart under the direction of the late Abbé Georges deNantes. Frère Michel, after writing this masterpiece retired to the secluded life of the Cisterians, of which order he is now the Superior. This work is of great historical significance since it it the history of the dark ages of the 20th century, the most backward, cruel, and barbaric of all centuries in the Chirstian era. It is a story however, full of hope and great beauty because it is the story of our age as God sees it. No Catholic or historian can afford to pass up the chance to read this entire work if he would understand the passion of our age and the years to follow.